Microsoft recently re-released its YouTube app for Windows mobile phones only to have Google block it again. While the two companies continue to collaborate on building an app based on HTML-5 at Google's request, Microsoft launched a non-HTML 5 app giving Win mobile YouTube users a similar experience to the applications that runs on Android and iOS phones. Writing the app in HTML-5 complicated the process. Since the interim app isn't based on HTML-5, Google decided to disable it, blocking "mutual customers" from accessing Microsoft's new app, according to David Howard, vice president and deputy general counsel at Microsoft. The company made the interim app available because Microsoft engineers believe Google isn't prepared to support a HTML-5 app. Howard believes Google's excuses for disabling the app -- not written in HTML-5, doesn't serve ads correctly, poor branding -- are just reasons to disable the YouTube mobile app and delay giving Win phone customers a comparable experience. "Our app serves Google's advertisements using all the metadata available to us," Howard explains. "We've asked Google to provide whatever information iPhone and Android get so that we can mirror the way ads are served on these platforms more precisely." So far, Google has refused to give this information to Microsoft, according to Howard. "We are quite confident that we can solve this issue if Google cooperates, but fixing Google’s concern here is entirely within Google's control," he said. "If Google stops blocking our app, we are happy to work with them on this, entirely at Microsoft's expense." A less-that-stellar YouTube app experience on a mobile phone running the Windows could turn consumers to other options running on Android and iOS. Howard highlights other concerns that Google raises, such as branding and degrading experiences. He also points out that Microsoft has been using the same branding on the app since 2010. 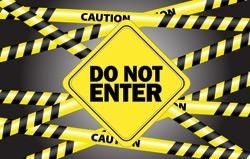 "Do Not Enter" photo from Shutterstock.